The Chardon School District received an additional $750,000 state grant to provide comprehensive mental health services to its students. The two-year grant comes more than three years after the fatal February morning when three Chardon students were killed in a school shooting. Students who were freshmen during the 2011-2012 school year graduated earlier this year, but the aftermath of the shootings still rings throughout the halls of the high school. Chardon administrators requested additional state support, citing trauma and anxiety that remains among the district, its students and staff. Superintendent Michael Hanlon made a plea to a state Senate committee in May for another $750,000 grant that was previously approved in the last two-year budget. "We feel very passionately about the fact that there's been a lot of important work that's been done in our school district the last two years in working with the recovery, as you can see evidenced by our students taking the events of that tragedy and turning it into something positive at Chardon High School," Hanlon said. "But there still remains a lot of work to be done and that's what these resources that the legislature has supported us with will go to." Sens. 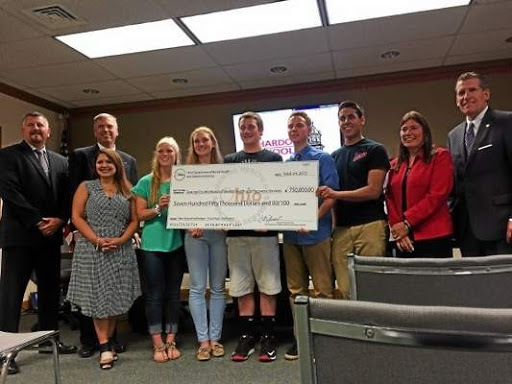 John Eklund, R-Munson Township, and Capri Cafaro, D-Hubbard, joined Chardon school officials and students Sept. 24 to present the district with a ceremonial check. Eklund and Cafaro were active proponents of the amendment that led to the additional grant. "This isn't something that goes away overnight," Cafaro said. "We need to commit the resources necessary to continue the healing process in the Chardon community. Just because we're not there and it's not on TV all day, every day and the satellite trucks are off the square, it doesn't mean that the pain isn't real or that the struggle isn't daily." The program funds resources for a long-term recovery model that provides the district with on-site services such as counseling and assessments available to students. "What has impressed me most about the school district and the community in general is how it's not just become a matter of recovery," Eklund said. "It's become a matter of actually going beyond and becoming better than we were before." The school district also provides peer services in which select students provide helping, supportive behaviors and acts of kindness. AC4P, Actively Caring for People, was founded at Chardon eight months after the shootings. A group of Virginia Tech students visited Chardon High School to share the AC4P concept, which received its start from a Virginia Tech professor after the deadly 2007 campus shootings that left 33 dead. The Chardon group has participated in numerous community service and school support projects. "It's really through this leadership model that the next generation of our community leaders are being evolved," Tracy Plouck, director of the Ohio Department of Mental Health and Addiction Services, told the five Chardon AC4P student representatives in attendance. "I think that the lessons that you are learning, it's critical. You're showing value and care to other people, but you're also gaining from these experiences yourself as a leader."